CASH CA designer kniwear is very well established in the UK and now in Japan and the Far East, but we are keen to develop new relationships with retailers in Europe and in underrepresented areas of the UK. 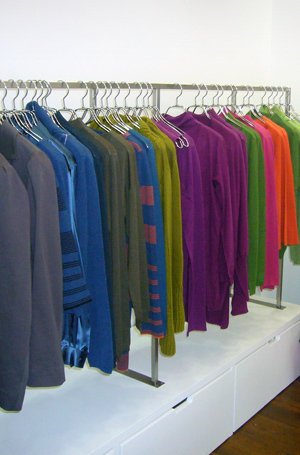 We are well known within the knitwear clothing industry for on time deliveries and supplying the highest quality garments with a minimal return rate. Our aim is always to exceed customer expectations but when things do occasionally go wrong we pride ourselves on prompt and proactive resolutions. If you are the owner of a great shop we will probably already know you and would love to be working with you. However we are very aware of the need to keep geographic exclusivity and it may be we already have a retailer in your area (we carefully protect existing retailers business by making sure no such conflicts arise). You can see immediately from our store locator if we are already selling through any stores close to you. If you are interested in selling CASH CA designer knitwear and you are in an area where we do not currently have a retail partner please contact us. We will be able to advise you of the level of interest we receive from potential customers in your area and discuss the possibility of working together. CASH CA has well established distribution channels in the UK, Japan and the Far East, but we are keen to develop relationships with agents and distributers in other key markets such as mainland Europe and America. If you are a distributer or agent already selling top end clothing brands and feel CASH CA designer knitwear could fit in well with your offer, please contact us.